Another month and another cryptocurrency exchange shuts down. However, this one was closer to home and highlighted the perfect storm created by regulators, banks and PSPs. According to Gatecoin, apparently without any notice, their account with Hang Seng bank was frozen. Their accounts at Alpen Baruch and Fubon Bank were eventually frozen as well, making it difficult to access actual investment funds. In the world of cryptocurrencies, this is not uncommon. Cryptocurrency business continues to face banking difficulties worldwide even today, reported Bloomberg. Companies are routinely denied access to even the most basic of banking services. Managing director of law firm Duane Morris & Selvam LLP, Krishna Ramachandra, who advises on a wide range of compliance and regulatory matters, touched on the catch-22 nature of the situation in Hong Kong. Regulators everywhere are still deciding how to regulate the cryptocurrency exchange scene, and it is becoming clear that the eventual regulations, standards and guidelines will vary from country to country. But the key point to note in situations like that of Gatecoin's is whether it is a regulated exchange. Jessica Chuah, the chief compliance officer of UDAX, another Asian crypto exchange, shone more light on this issue. Hence in a regulated scenario, an exchange like Gatecoin would have safeguards put in place for its creditors, investors and equity partners and appointed a provisional liquidator to recover funds and refund the various stakeholders. In other words, it is up to the investors to take on the high risks. 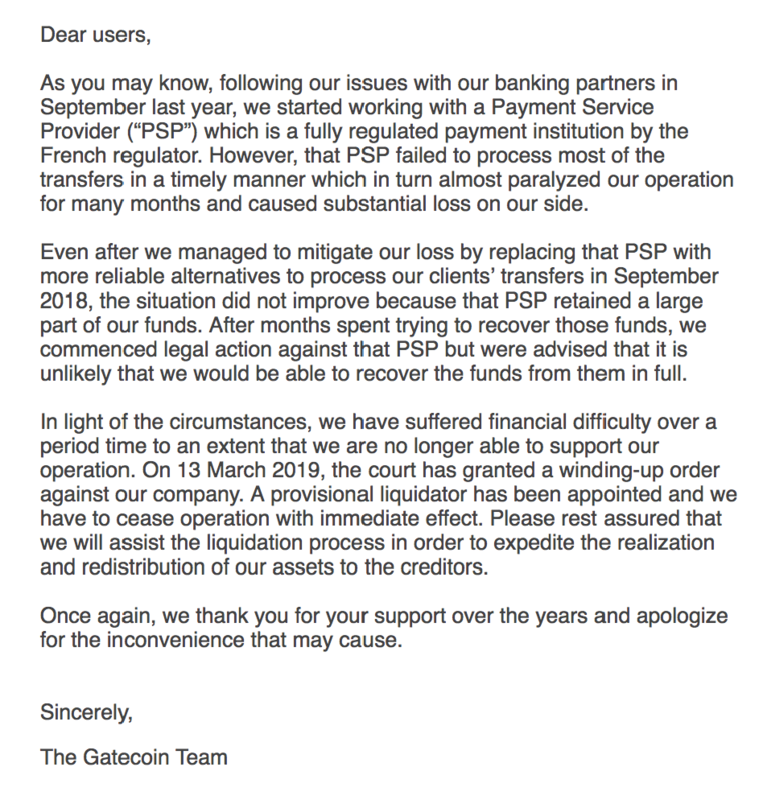 And in Gatecoin’s scenario, it also includes bank, PSP and regulator risks that evolved into an unfortunate, yet perfect, financial storm.